There are many local military families who have a family member deployed this holiday season. Shine Family Foundation hopes to provide toys for the children of a parent or parents who will not be home for Christmas who are with the Nevada National Guard, Nellis and Creech AFB. Hundreds turned out at Body English March 17th to be entertained and help raise money for Shine Family Foundation. 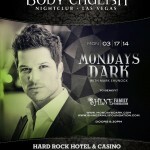 Monday’s Dark with Mark Shunock brought out some of the best Las Vegas entertainers. “We were so honored and excited that Shine was the choice charity that Monday’s Dark selected for Saint Patrick’s Day’ said Shine Founder Rowena Krifaton. Dressed to Thrill – Success! Dressed to Thrill – Press This Image to Purchase Tickets for this event. 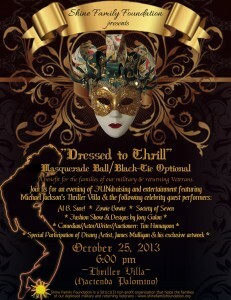 The persona and mystery of how Michael Jackson lived comes alive October 25th when Shine Family Foundation hosts “Dressed To Thrill” at The Thriller Villa the home Michael rented in Las Vegas right up until his death in 2009. The 1.75 acre estate will be center stage for Shine Family Foundation’s fundraising Masquerade Ball / Black Tie Optional evening. The event will feature your opportunity see and experience the house, including the Neverland Chapel, the Kings Court, Artists Vault (once housed much of Michael’s art collection), cellar, tunnel and more. Most people who have visited the Villa have not experienced the vaults, cellar or tunnel. Guests will be entertained by the likes of R&B superstar Al B Sure, Las Vegas’ Zowie Bowie. and Society of Seven. ‘America’s Got Talent’ finalist Seth Grabel will also be at our event entertain you with his magic and illusions. There will also be a fashion show by renowned fashion designer and TV host Joey Galon who will host the Red Carpet. Las Vegas’ other favorite Jackson, FOX5′s Monica Jackson will host the rest of the evening. There will be both live and silent auctions. LA based Comedian Tim Homayoon will be our auctioneer. Items up for bids so far includes trips to Hawaii including accommodations, the artwork from Disney’s James Mulligan a huge supporter of foundations, jewelry from New York Diamond Exchange and more. Hors d’Oeuvres and open bar are included in the $125.00 ticket price which is tax deductible. Tickets are available online at shinefamilyfoundation.org and our event page https://www.formstack.com/forms/securedata-dressedtothrill. This is an exciting time for The Shine Foundation. We have partnered up with an amazing company. The company is Relief Poker, and what they have offered to our Charity is, again, amazing. Relief poker has built a Poker Room for The Shine Foundation and is providing up to 100,000 dollars in cash/prizes each and every month. 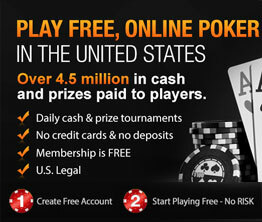 The Shine Foundation will soon have Tournaments showcased in the Tournament section on Relief Poker’s site. To ensure that no member of the US Military and their families fall through the cracks by providing support and assistance to military families during special times when they are separated due to deployment. 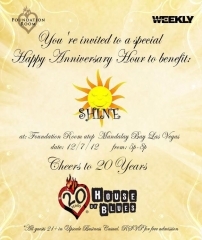 House of Blues in Cooperation with Las Vegas Weekly presents “Happy 20th Anniversary Hour” (meet and Greet your local tv and radio personality). 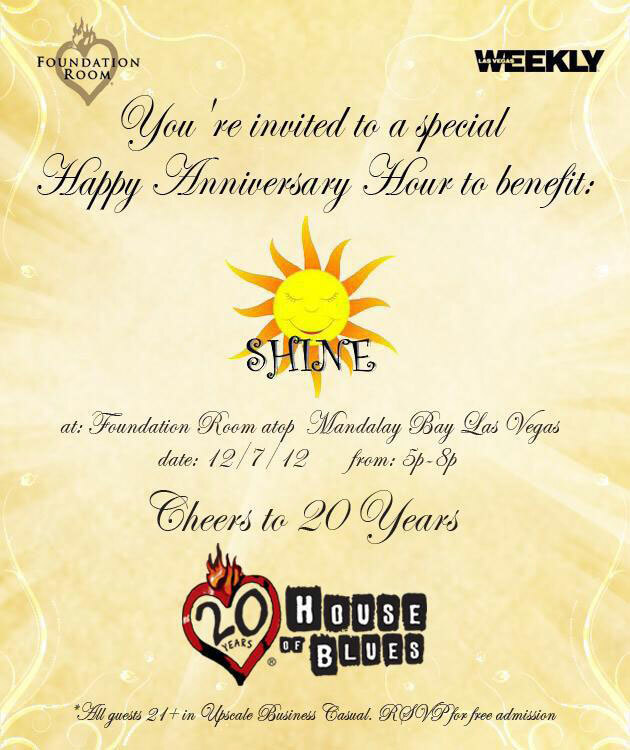 This event is A BENEFIT FOR SHINE FAMILY FOUNDATION. This is STRICTLY an RSVP event at the FOUNDATION ROOM. If you haven’t already, please RSVP at our FB event page or call us at (702) 324-3286 so we can put you on the list. Friday October 26th, Lake Las Vegas and SinCity Car Scene hosted a Zombie Bar Crawl where participating bars/restaurants and merchants offered up ten sample cocktails for just $10 dollars. 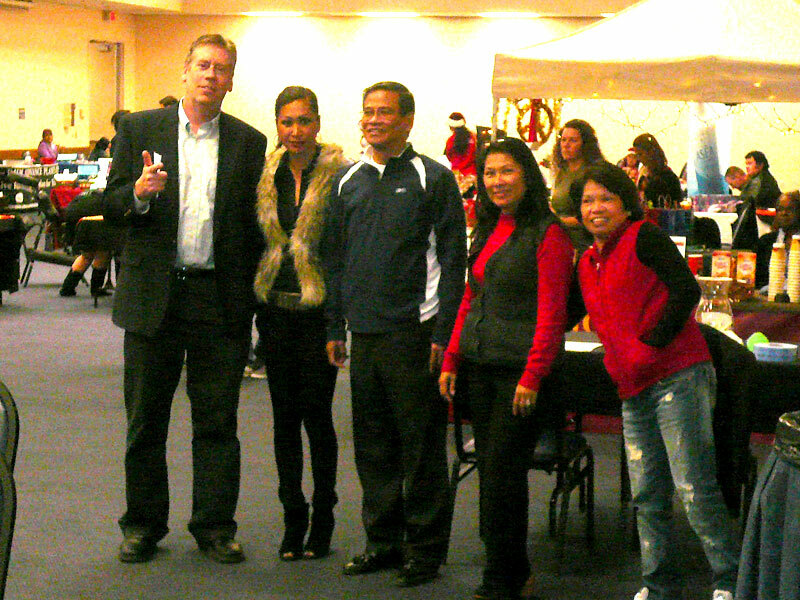 The money raised was donated to our foundation which helps the families of our deployed military and veterans. 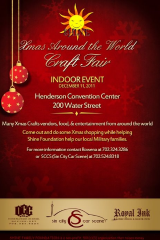 would like to invite you to join us at the Henderson Convention Center 200 South Water Street, Henderson, NV on December 11th, 2011 from 11am to 5 pm to celebrate the season and help us help the families of our military who are deployed. 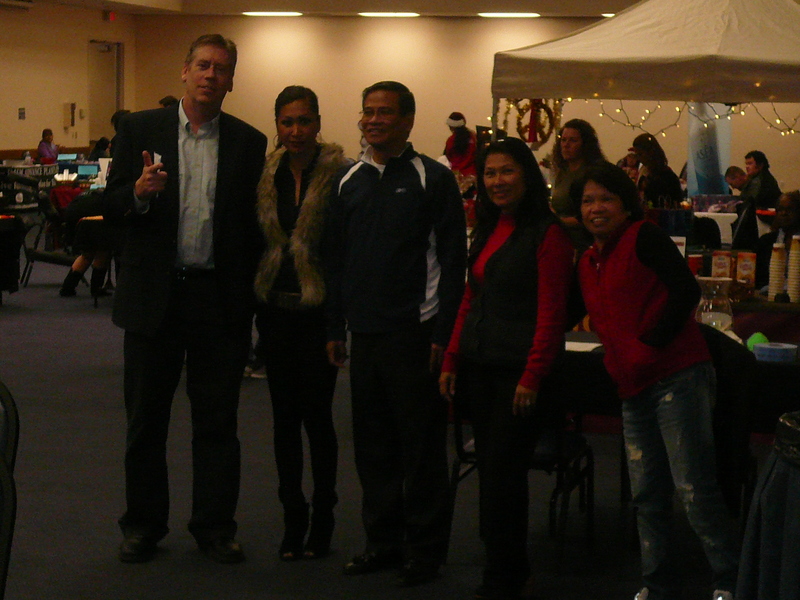 Our event is a year end recital for dance groups and choirs, as well as a seasonal arts and crafts sale. It’s free to attend and it’s free for performing groups who can also raise money for their organizations. 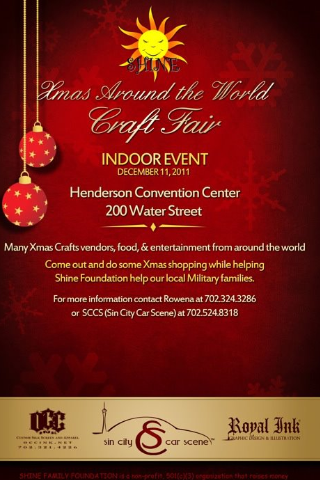 If you would like more information contact Rowena at 702 324 3286 or SinCityCarScene at 702 524 8318.